The photograph of James E. Callahan taken by Henri Huet is one of the most iconic photos taken during the Vietnam War. 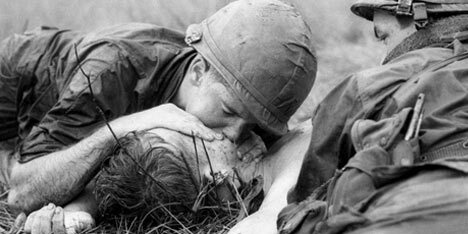 The Photographer captured Medic Callahan giving mouth-to-mouth resuscitation to a dying soldier. Callahan that day June 17, 1967 was trying to save the lives of many of his buddies in the midst of machine gun fire and mortar barrages. The photograph is a testament of the horror of war. It is not just that which makes this a remarkable image, it is the look on Callahan’s face that tells the entire heart wrenching story. A story of desperation and helplessness of sadness and loss. Arguably, the quintessential story of Vietnam. With sniper fire still passing overhead, Callahan treats a U.S. infantryman who suffered a head wound when a Viet Cong bullet pierced his helmet. During the three-hour battle in war zone D, about 50 miles northeast of Saigon. During the guerrilla ambush on the 1st Infantry Division on June 17, 1967, thirty-seven men were killed and 150 more wounded.